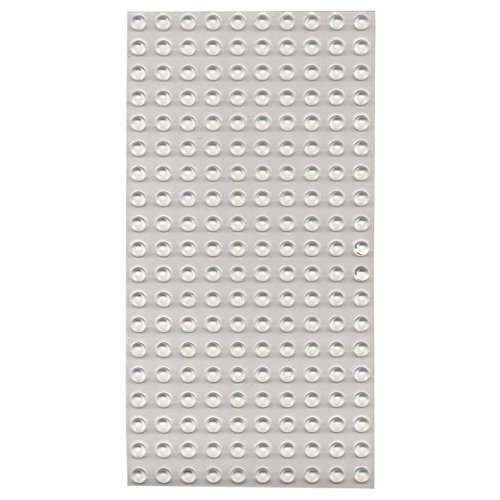 Clear Cylindrical Bump Dots (Round with Flat Tops) Size: Medium (.375-in. Diameter x .190-in. High) Count: 200 Why use Bump Dots? Bump Dots for the Blind and Visually Impaired are a great way to tactually mark buttons on appliances and electronics, computer keyboards, TV's and remotes, copiers, printers, etc. Use them at home or in the office for marking a countless variety of items. Made of durable soft plastic, these tactile dots have a self-adhesive backing for fast, easy application on most hard, clean surfaces (plastic, metal, etc.) Adhesive will not damage the product's surface.